I would like to discuss about Force, Work and Energy form the point of view of a structural engineer. These are the fundamental quantities and proper understanding of these terms is necessary for a structural engineer. The basic definition of force that we have learned is that force is push and pull. Force when applied to an object tends to change its motion or its shape. In structural engineering the terms force and loads is used interchangeably. Load is a term frequently used in engineering to mean the force exerted on a surface or body. There are 5 basic types of loads in structural engineering. A force applied in the lateral axis would try to slice off the member (Shear force), bend the member (Bending Moment), or would try to twist the member(Twisting Moment/Torsional Moment). Work is when you do something. You work at your office or classroom. In your daily life the things done by you is termed as work. In Physics, work is energy transferred by force. Work and energy are interdependent. The unit of work is Joule, which equals to 1Nm. Energy is the ability of a system to perform work. When you are sick and say that you don’t feel energetic, that implies that you would not be able to do work. You don’t have the sufficient energy required to perform work. On the other hand when you are fit you feel really energetic. Your body converts food into energy that is then stored in your system for use. Similarly in a mechanical system the energy is stored in various forms which helps the system to perform work. For example when an archer stretches the string of the bow, elastic potential energy is stored in the string. When the archer releases the string the energy stored in the string performs work on the arrow, moving the projectile forward. Let us understand the above terms by considering the following example related to structural engineering. When external loads are applied on an elastic body they deform. 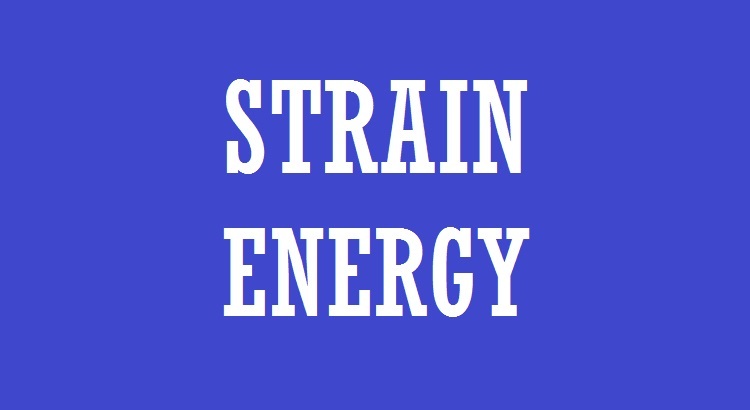 The work done is transformed into elastic strain energy U that is stored in the body. This energy is then utilized by the system (elastic body) to bring it back to its original configuration. This energy is also used by the system to keep the load applied on the body in a state of equilibrium. Let us understand this by again considering the above example of an axial force applied to the bar. 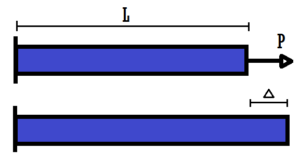 For the load P to remain in equilibrium the bar has to generate an equal and opposite force P. The system in itself doesn’t have any inherent energy to generate the required force. Hence, it deforms (strains) in the direction of the force. Thus work is done by the force P in deforming the bar from its initial position to its final position. This work done is stored as elastic strain energy in the system which then generates the required amount of force to counter the applied load. In the above figure we could see that when the load is applied to the bar there is no reaction from the bar to the applied loading. Only after it deforms it is able to give the opposite reaction. The system will deform till it has generated enough strain energy to produce the force equal to the applied load. At this point the system stops deformation, and, we say that the system has attained a state of equilibrium. What is the importance of all this in engineering? The world we live in, to our understanding is governed by the laws of physics. Proper understanding of these laws would help in better engineering judgement. When we start designing any system we have to design in such a way so that the load transfer is efficient and the deformations are under control. The reason for the deformation of any system is that it has to generate the required amount of strain energy to resist the applied loads. Thus by properly understanding the deformation behavior of the system we could greatly enhance the efficiency of the design. These fundamental quantities also lay the foundation for various principles that we use to analyse and design the structure.